The beginning of my third week working at Piers Park and McDonough so far has been terrific. By my third week I've met over 30 kids and they were all great kids to teach. The kids that I have worked with are all hard working and always looking forward to learning new things. When I first started working I expected the kids to be rowdy and wild but they proved me wrong and they were all awesome. My favorite activity to do with the kids is "drip,drip,drip,drip,drench" and this game is another version of "duck,duck,duck,goose" in which we use water to drop it on people instead of saying goose. 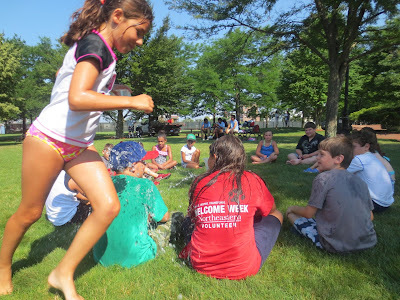 I love this game because it cools the kids down when its really hot outside and they have fun doing it. Today on a rainy day when I expected no kids to show up, there was a total of 5 kids that showed up and that's a third of the kids that we usually have. The kids really made me smile today by showing and letting the Blue Team know that not even rain is going to stop them from showing up. Today we had a blast because we tried to fish and every time we reeled the rods there was always a crab on the other side. Over all we had pretty good day in the rain, we colored, played games and everyone was happy that they showed up today. Sarah teaching the kids the importance of the balance of the ocean. Sarah explained to the kids how the fish's inside works and how they reproduce and how they change over time. The kids were coloring after we came up from the dock. They were all very excited to color the different types of fishes we had available. I even colored a crab to be involved with the kids.